Direct Drive Pumps Direct drive or, motor driven pumps, provide a high torque, high head height and flowrate option. These pumps need to be operated within a specific performance curve to optimize performance and lifespan. EasyPro Stainless Steel TH Pumps are Energy Efficient, Long Lasting, and Great pumps for waterfalls and streams. The TH Series� of pumps have proven to be a great choice for ponds, waterfalls, fountains and similar applications. Thousands of these pumps are in use throughout North America in a wide variety of continuous duty applications. Compact design is ideal for use in skimmers. One of the industry™s best selling pumps! Tsurumi Submersible Pumps for Professional Water Feature Applications are energy efficient pumps designed for continuous duty applications, known for their reliable operation. Tsurumi's PN series pumps have had a successful presence in the water feature market for close to a decade. The PN series provides a good match for ponds with higher heads or require a verticle style pump housing. The Alita AUP Submersible pump series is specifically engineered to handle the tough, demanding task of effluent water transfer with high efficiency and long-term dependability. Constructed with lightweight engineered plastic and stainless steel pump housing, the compact Alita AUP pumps offer excellent corrosion resistance. 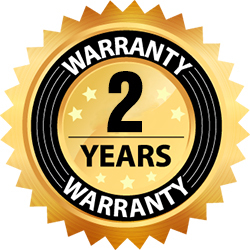 AquascapePro pond pumps are energy efficient and low maintenance. Quiet and efficient, these oil-free pumps have stainless steel construction, along with rubber feet to reduce vibration. With high head heights and huge flow rates, the AquascapePro line excels in the water gardening industry. 13" x 6.5" x 7"
12.5" x 9" x 17"
Tsurumi submersible water feature pumps are submersible pumps designed to circulate water in garden ponds, create waterfalls and water features. Durable resin molded parts aid in longer overall pump life. Semi-vortex, fiberglass reinforced plastic, impeller passes solids and stringy material without clogging and increases wear resistance when abrasive particles are present. Ideal for use in ponds, waterfalls, and decorative water features. 9" x 6" x 15"
12" x 8" x 15"
The LittleGiant PE Series Direct Drive Pumps are designed to operate continuously and produce greater starting torque and more pressure than comparable mag-drive pumps. These pumps are ideal for use in fountains, filtration, waterfalls and streams. Pre-filter is included to protect the pump. Oil free, continuous duty pumps. Solids handling pump for dirty pond water. Double ball bearings for high efficiency and quiet operation. Capacitor start motor for instant torque. Ceramic shaft sleeve and triple seals provide extended life in abrasive environments. Handles semi-solid material up to approximately 1 1/4"
Leader Clear Answer Pumps are submersible pumps specifically designed to circulate water in garden ponds, create waterfalls and water features. Suitable to pump water containing particles with maximum diameter up to 1/2". 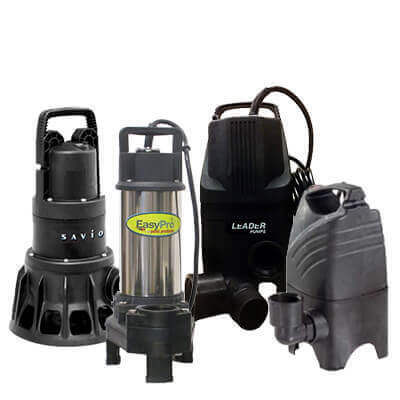 Leader Ecosub Manual Pumps are multi-purpose submersible pumps designed to circulate water in garden ponds, create waterfalls and water features. Suitable to pump clear water containing particles with maximum diameter up to 1/4". The PerformancePro WellSpring submersible pump line is designed for easy in-pond, skimmer, or sump installations. The high quality components and durable construction ensure efficient operation and long term reliability. The semi-open impeller design aids to prevent clogging and waterproof cable and seals protect the pump motor. Available in 1/4 HP to 1 HP sizes. Tsurumi sets the standard when it comes to pumps. They are world-renowned for their quality, dependability and performance. Tsurumi's engineers have designed our new pump line to be hydraulically "dialed" into the typical lower head water garden applications. This helps ensure that the pump is performing in its ideal operating range resulting in less vibration and wear and tear on the pump, ultimately resulting in longer pump life. All new rugged design! Savio Water Master Solids Handling Pumps are Savio's top of the line model for professional use. Heavy duty construction - they can handle spherical solids up to 1 1/4". Thermal overload protection protects pump from burn-out. The ideal choice for creating dramatic waterfalls and water features - at an affordable price point. 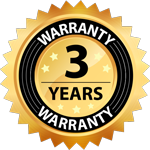 Water Master Clear Pumps provide the high level of reliability and durability that professionals demand. Utilizing the same wear-resistant, internal components as Savio's industry leading Water Master Solids series, Water Master Clear pumps trade solids handling capability for higher head pressures. Housings and internal components are completely non-corrosive and oil-less for the safety of fish and plants. From experience, we've learned when pumps fail due to mechanical issues, it's normally from water entering a pump's motor casing through worn impeller shafts, bad bearings, or worn seals. Savio Water Master Pumps feature heavy-duty sealed ball bearings, a ceramic-coated shaft for hardened wear resistance, and - virtually unheard of in the business - an innovative third lip seal on the impeller for maximum protection (the majority of pumps only use two). Our engineers have addressed it all - even built-in thermal protection to protect the pump in case of a low water condition. Atlantic TidalWave SH-Series pumps have proved over the years to be one of the most dependable, energy efficient, solids handling direct drive units available. Atlantic SH-Series Direct Drive pumps thrive in dirty water applications, with higher head pressure and solids capability up to 1 1/2" in diameter. The non-corroding and high impact composit housing with stable base make them the perfect clean-out pump for pond cleanings. Thermal overload protection shuts down pump before overheating can cause damage. 6" x 9" x 11.75"
6" x 9" x 12.5"
6" x 9" x 14"
9.5" x 12" x 15.75"
Tidal Wave A-Series & L-Series Pumps are manufactured from cast-iron and stainless steel with precision motors and thermal overload protection. These professional-grade pumps are engineered for high volume applications and perform where most cannot. Double Inside Mechanical Seal With SiC faces provides longest operational life. V-Ring Seal Protector protects mechanical seal from abrasive particles. Handles liquid and solid waste materials up to 1/2" diameter solids. Epoxy coated cast iron motor housing for corrosion and rust resistance. Non-Toxic Oil filled motor housings for lifetime lubrication and rapid heat dissipation. Mechanical shaft seal (stainless steel spring, nitrile parts, carbon and ceramic faces). These Versa Gold Series epoxy encapsulated Beckett Pumps have been designed for longer life in continuous duty applications, such as waterfalls and water gardening. These pumps are recommended for statuary and other clean water applications but are a great choice for small ponds when used in combination with a foam filter. We suggest the M.A.N. internal biological tub filter #3 for the G210AG20 and the G325AG20 and the M.A.N. internal biological foam filter #1 for the G535AG20. Please Note: Versa Gold pumps do NOT include intake pre-filter as pictured. We recommend purchasing the foam prefilter, item #71377. 3.25" x 2" x 4.25"
4.5" x 7.2" x 9"
Constructed with stainless steel, cast iron and durable thermoplastic, the WGFP-Series solids handling submersible water feature pumps meets the rigorous demands of the most impressive water features. Corrosion resistant body designed for submersible use and continuous operation. Spirit pond and stream pumps. Energy efficient direct drive pond and stream pumps ideal for use in skimmer. These compact units can be used vertically or horizontally. The new Spirit pumps by EasyPro are made in Italy with quality components for years of reliable service. Three sizes meet the needs of a wide range of pond and stream applications. EasyPro TM Low Head Series Pumps are Perfect for streams and waterfalls! This submersible trash pump handles sand, solids, leaves, algae and other debris up to 3/8" x 1" in size. Ideal for waterfalls where algae and leaves are a problem, recirculating systems where solids removal is needed, dewatering applications where sand and sludge are being pumped, or any other dirty or clean water application where a high quality, continuous duty pump is needed. Calpump Waterfall Pumps are solidly constructed with non-corrosive components, ceramic mechanical seal and a brass insert in the 1 1/4" FNPT discharge. Their water cooled design ensures safe and efficient operation without fear of harm to ornamental fish or aquatic plants. The CalPump T-series Torpedo pumps are designed for use in water displays, ponds, waterfalls, aeration applications, and to power large biofilters. Oil-free they are safe for fish and plants. They can be used in or out of water. Little Giant small submersible pumps are designed for continuous circulation of ponds, fountains and statuary. Made with the most durable of materials, they are ideal for continuous use and designed for submersible use only. Anjon Big Frog Waterfall Pumps are high head, energy efficient direct drive pumps. Each Big Frog pump can chop up solids up to 1-1/4”. Big Frog pumps come with high quality seals for long and efficient pump life. Each pump is low energy, which saves you money and electricity. The Anjon Big Frog pump comes with an overload sensor that prevent pump burnout. Engineered for 24-hour continuous use. It contains no oil, so it is aquatic plant and fish safe. 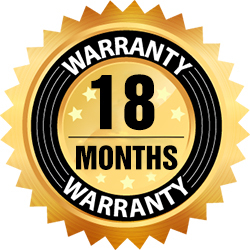 The Big Frog pump comes with a 2-year warranty.